SUPER DUPER EASY AND DELICIOUS! *You know my advice: Don’t add salt and pepper in cooking. You can always add salt and pepper to taste when eating if needed. **If you are highly sensitive to gluten you should drain and rinse the chickpeas well. Place all ingredients except lime juice, peanuts and cilantro in slow cooker. Put on the lid and cook on LOW until the lentils have begun to break down, 5 to 6 1/2 hours. Stir in lime juice. Serve sprinkled with peanuts and cilantro if desired. Nutrition Bonus: Vitamin A (310% daily value), Vitamin C (50% dv), Folate (30% dv), Potassium (27% dv). Place beans, onions, mushrooms and tomatillos in slow cooker. add spices and broth. Stir in tomato paste and pepper sauce. Turn heat to LOW. Put the lid on and cook until the beans are creamy, 5 to 8 hours. Garnish each serving with cheese, a dollop of sour cream and a sprinkling of cilantro. Serve with lime wedges. Nutrition Bonus: Fiber (52% daily value), Folate (47% dv), Iron (22% dv), Potassium (21% dv). Sprinkle the chicken breasts with the salt and pepper*. Place flour in a shallow dish; dip chicken in flour, turning and pressing to coat all sides of the chicken. Preheat a large skillet over medium-high heat. Add the olive oil to the skillet; swirl to lightly coat the skillet. Add chicken breasts, smooth sides down and cook about 5 minutes or until the chicken is golden brown. Turn chicken over; cook for 4 to 5 minutes more or until chicken is no longer pink (165 degrees F). Transfer chicken to a warm serving platter; set aside. Add the shallots to the hot skillet; cook for 2 minutes, stirring frequently. Carefully add wine; cook about 1 minute stirring to scrape up any browned bits from the bottom of skillet. Add chicken broth to the skillet; bring to a boil and cook for 3 to 4 minutes or until liquid is reduced by half. Stir in chives. Return chicken to the skillet; heat through. Serve the chicken and wine sauce with the veggies on the side. In a second skillet heat 1 tablespoon olive oil and 1 minced garlic clove. Add about 2 cups of sliced seasonal vegetables** (zucchini, peppers, asparagus, etc.). Saute just until barely tender and sprinkle with your favorite herb, salt and pepper to taste*. *THOSE OF YOU WHO KNOW ME ALSO KNOW TO NEVER ADD SALT AND PEPPER IN COOKING. ADD IT IF NEEDED AT THE TABLE OR USE OTHER SPICES – MOST OF THE TIME YOU DON’T NEED IT! **THERE ARE ALSO MANY STEAM IN THE BAG OR FROZEN MIXED. VEGETABLES THAT COULD BE A QUICK ALTERNATIVE TO CHOPPING FRESH. I ALSO SAUTE WITH VEGETABLE BROTH INSTEAD OF OIL. *My mother used to make Sloppy Joe Sauce using 1 cans Campbells Chicken Gumbo soup with 1 T yellow mustard so you could also try that – no longer vegetarian though. Coat a 6-quart slow cooker with cooking spray. Add all ingredients and cook on LOW 6-8 hours. Serve the mixture on buns. 1. Make the chickpeas first. Heat the olive oil in a skillet over medium high heat and then add the chickpeas and cook for about 4 minutes until they start to turn brown. Mix together the lemon juice, honey, and soy sauce in a small dish, and then add this to the chickpeas. Stir it around and let it reduce for a couple minutes, and then add all of the spices. Cook for a few minutes more and then remove from heat into a bowl covered with foil. 2. Rinse out this pan (I like to actively reduce the amount of clean-up time later. 😉 ) Heat the olive oil and butter over medium-high heat and add the garlic. Cook for about 1 minute and then add the kale. Cook for about 3 minutes stirring occasionally until the kale wilts down. If you like crispier kale, like I do sometimes, turn up the heat. Throw in the sesame seeds and remove from heat. 3. In a bowl mix together the lime juice, honey, and apple cider vinegar and then toss in the red pepper and cilantro. Toast the taco shells and assemble to your liking. Top with some lime juice and queso fresco. PORK CHOPS AND APPLE STUFFING! PERFECT FOR A COOL FALL DAY! PLACE THE CHOPPED ONION, CELERY AND APPLES IN THE BOTTOM OF THE CROCK POT. ADD CHOPS ON TOP. POUR IN BROTH AND SOUP AND COOK ON LOW 6-8 HOURS. 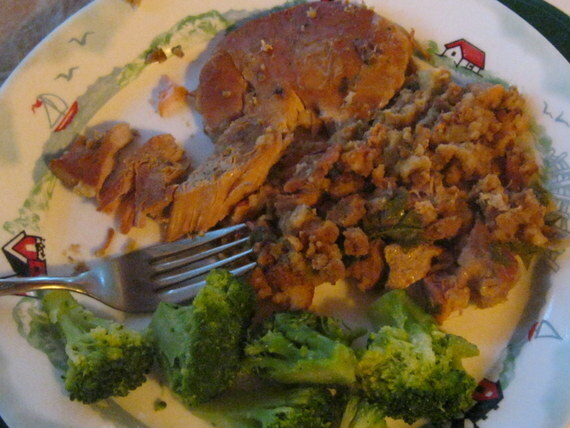 IN THE LAST 30 MINUTES OF COOKING I TOOK OUT THE CHOPS AND SOME LIQUID AND ADDED THE STUFFING CUBES UNTIL MOISTENED. ADD THE CHOPS BACK INTO THE CROCK AND SAVE THE RESERVED LIQUID FOR SAUCE. I SERVED WITH SOME FROZEN BROCCOLI FLORETTES. I THOUGHT THIS LOOKED LIKE A NEAT COOKBOOK ESPECIALLY FOR A DIETITIAN TO HAVE TO GIVE PARENTS A FEW IDEAS TO GET THEIR KIDS EATING HEALTHIER. As a mother of three, Jessica Seinfeld, like many busy parents, used to struggle to get her kids to eat right. In Deceptively Delicious: Simple Secrets to Get Your Kids Eating Good Food, she shares her solutions: easy, mouthwatering recipes that even the most overwhelmed families can make—stealthily packed with unseen veggies, puréed so kids will never suspect. About the author: Jessica Seinfeld is a prominent philanthropist and activist. She is the bestselling author of Deceptively Delicious and the President and Founder of Baby Buggy, a non-profit organization dedicated to providing clothing and equipment to New York’s families in need. She is the wife of Jerry Seinfeld, with whom she has three children. A portion of the proceeds goes to support Baby Buggy. Create a rice-based dish, but using cauliflower instead of grains. If you’ve never tried grating cauliflower and using it like this, I urge you to try it! It’s surprising how the cauliflower takes on a rice-like appearance once it’s cooked, and if you’re following a carb-free/Paleo diet, it’s ideal! I’ve used quite a wide-ranging combination of spices, but if you wanted to add your own favorites, and dial the chili up or down, feel free! The sweetness of the raisins and the crunch of the almonds and seeds add really great dimensions to the dish, and I think you’ll all love it! I’VE ADAPTED THE RECIPE A BIT USING LESS SPICES (I’M NOT FOND OF CURRY AND I’M NOT SURE WHAT MIXED SPICE MIXTURE SOMETHING CLEAN SOMETHING GREEN USED)! Grate the cauliflower using the coarse side of a box grater, and set aside in a bowl. Put a frying pan on a medium heat, and add the coconut oil. Finely chop the red onion and add to the pan. Cook for around 5 min, stirring regularly until the onions are starting to color. Add the spices and stir well. Cook for another 2 min. Add the grated cauliflower and raisins, and stir well to mix everything together. Cook for 10-15 min, occasionally adding a splash of water to the pan if it’s looking a bit dry. Meanwhile, heat a small frying pan on a medium heat and add the almonds and seeds. Cook for 5 min, shaking the pan regularly, until they’re starting to brown. I OFTEN USE THE TOASTER OVEN TO BROWN THE NUTS AND SEEDS BUT EITHER WORKS WELL! Once the cauliflower is cooked, take off the heat and season with salt & pepper**. Pile onto a plate and sprinkle the toasted almonds and seeds. Enjoy! *I DON’T TYPICALLY USE COCONUT OIL IN COOKING. IT IS A SATURATED FAT AND IN THIS RECIPE YOU HAVE PLENTY OF UNSATURATED AND POLY-UNSATURATED FATS FROM ALL THE NUTS AND SEEDS. I WOULD USE SOME LOW SODIUM VEGETABLE BROTH INSTEAD TO BROWN THE ONION. **I NEVER ADD SALT AND PEPPER TO MY RECIPES. WHEN I SIT DOWN TO EAT THE MEAL, IF SOMETHING NEEDS SEASONING I CAN USE OTHER OPTIONS LIKE MRS. DASH. THE SEEDS I HAVE ARE ALREADY SALTED AND THE BROTH I WOULD USE, WHILE LOW SODIUM, WILL STILL ADD SALT SO SKIP IT!! Combine bell pepper, beans, green onions, cumin, chutney, cilantro and corn in a bowl and stir gently. In a saucepan bring water to boil and stir in lentils and rice. Reduce to low temperature and cook uncovered until liquid is absorbed and the lentils are tender (20-25 minutes). Remove from heat and stir in the bean mixture. Cover and refrigerate, until chilled. Gently stir in spinach before serving. JUST 4 INGREDIENTS – SUPER FAST AND EASY! Cut zucchini in half lengthwise. Scoop flesh leaving 1/4 inch thick shell. Dice flesh if needed. Place in a large nonstick skillet and cook along with the sausage about 5-10 minutes. I used sausage links so I cut them up. Place mixture in a bowl with the tomatoes and stir. In the same skillet place zucchini halves face down. Add 2-4 Tbsp of juice from the sausage mixture. Cover and cook 2-3 minutes. Flip zucchini over; cover and cook 2-3 minutes. Zucchini should still be crisp. 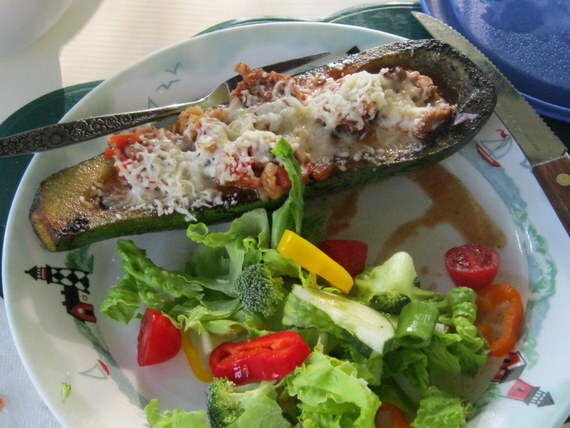 Place zucchini halves in 13 X 9 baking dish and fill with sausage mixture. Top with cheese. Bake at 350 F for 20-30 minutes or microwave on HIGH about 5 minutes.